Deleting your Google history encompasses more than just periodically wiping your browser history. Knowing how to manage your Google account optimizes your privacy while keeping you from stumbling into embarrassing situations, like when your boss finds out you were actually shopping for pink cat castles instead of nose-grinding that latest report. Google’s Web and App history keeps tabs on all your searches all the way back to 2005. Do you remember what you were doing (and searching for) over a decade ago? Probably not, and if you do some of those searches might be cringe-worthy. If you have a sentimental side and want to back up your search history, Google lets you download all your past searches just in case you don’t want to lose all those spot-on Chuck Norris facts you were loving back in the day. 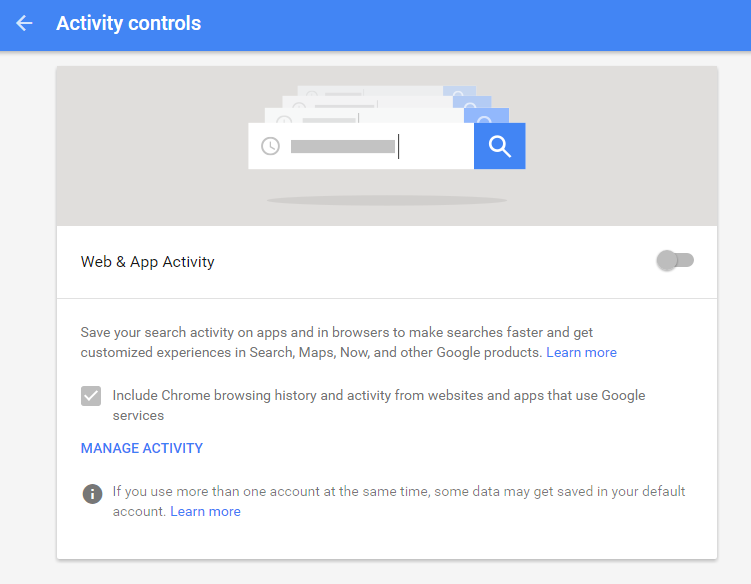 Where do I manage Google activity? While signed into Google, head to My Activity in your account privacy settings. Here you can view and control all of your online activity such as videos you’ve watched and websites you’ve visited. Any time you use key Google services and products including Chrome, YouTube and Search, this “activity” is saved in your account. Saving your habits and preferences helps Google tailor a better and faster experience. On the My Activity page, all activities are listed in chronological order and are usually listed individually, but can sometimes appear “bundled” by default in similar groups. Keep in mind that Google can only save activities when you’re logged into your Google account. You can customize which activities are monitored via Activity Controls. Note: when we tested this for ourselves, the settings weren’t saved and reverted back to being on as soon as we left the page. We’ve contacted Google to ask about this behavior. 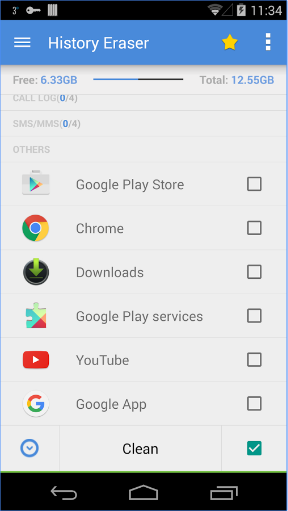 Deleting your activity, and personalizing your Activity Controls so Google no longer saves specific (or any) future activities is the first step in permanently deleting your Google history. There are many ways to do this, including deleting items individually, deleting related activity, deleting activity via search and features, deleting activities by day and/or time, or you can simply delete everything in your Activity. Individual deletions are very popular. Simply go to the My Activity page, find or search for the item, and click More – Delete. You’ll be asked to confirm this deletion. If you want to delete “bundles,” sign into the My Activity page and identify the bundle. You can find them by searching for More – Bundle view or looking for bundles by day. Search and filters options can also help you suss out tough to find bundles. Click More – Delete and confirm the deletion. 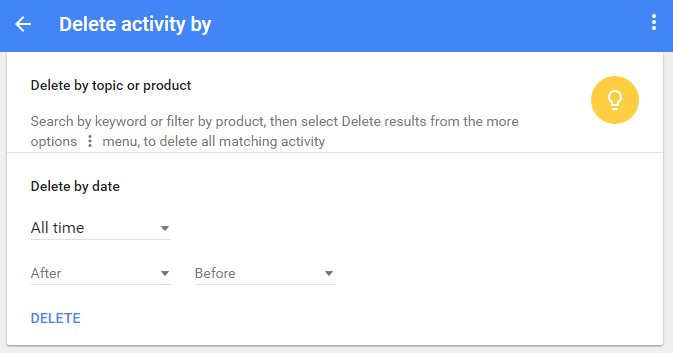 On the My Activity page, click on “Filter by date & product” to access searching by terms or a specific date range. 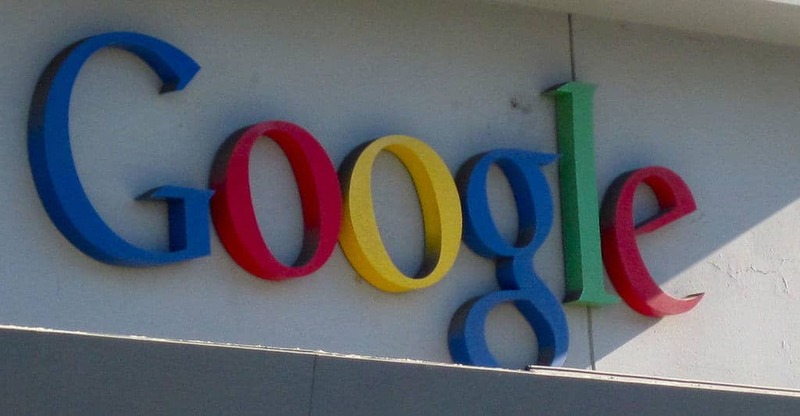 You’ll be asked to pick which Google products to search. You can then click items to delete, or delete them all by clicking on “Delete results” before confirming deletions. Looking for a clean slate? Visit My Activity, then click on “Delete activity by” before selecting “All time.” Click “Delete,” confirm, and you’re squeaky clean! 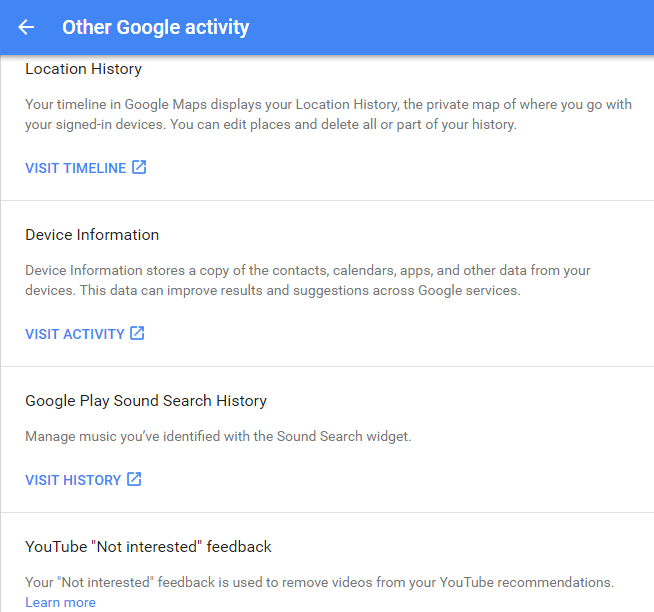 Location history, device information, Google Play sound search, and Youtube “not interested” feedback can all be found and deleted from this tab in the left sidebar of the My Activity page. This is also where you can download your search history. As of 2015, North Americans officially use mobile devices more than desktop for just about everything they’re doing online. If you want to keep your phone clean and erase Google searches from your Android device, you’re in luck. One of the most popular apps is History Eraser – Privacy Clean, available on Google Play. It’s the app that erases app histories with a single swipe. You don’t need admin/root permission to use it, it’s fast and easy, and it’s a great way to up your privacy and free up storage. In seconds, it helps you clear browser histories, call logs, text messages, market search history, Google Search and Map history, Gmail search history, YouTube search history, app cache files, download history, and more. With a 4.6 out of 5 rating by users, it’s a popular pick, but many users note that the pop-up ads are annoying. However, for a free app, most users think the annoyance is worth it. If you’d prefer to go ad-free, download the pro version for just $1.99. Permanently deleting your Google web, app and browsing history can increase your privacy, but it does come with drawbacks. These settings are designed to give you the best user experience based on your searches, saves and preferences, in addition to targeting you with advertisements. If you visit one website more than others, Google will offer that preferred website for future searches before all others, for example, but only if Google is allowed to remember your search history. Once your history is deleted and/or disabled, you’ll get much broader search results. Your favorite websites might no longer appear at the top of Google search results, or even on the first page. Plus, deleting or disabling your history won’t make you “invisible” in the eyes of Google. This goes double if you keep a Google account like Gmail. 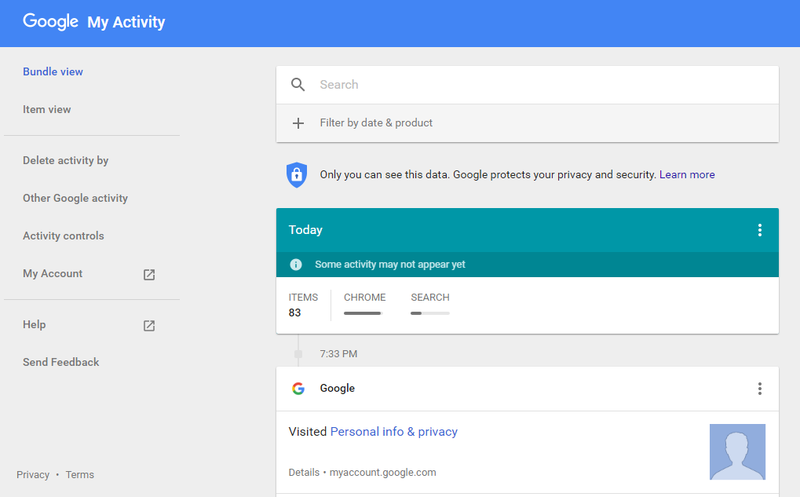 You can’t go totally off the grid and still use Google, but you can stay more on top of your privacy by monitoring and managing your Google Activity hub. Dear after deleting the history ,from manage activity an archive is downloadable from which searches and other history is down able.Can anybody give me the solution for permanent deleting account history? every time i delete my activity it reappears every time i sign back into my account, any suggestions? Good day, Please advice whether one is logged into one account on 3 different PC’s if it collects data on google activity from all 3 and if its specifies which pc searched what? I believe you can view activity from each device and yes Google collects data from all three. Hi. On my google activity I only have maps and search as a product filter and I see on other people’s they have images, videos, you tube etc. why is it that I only have these two as options? Very time I deleted the Google activity history it reapers in full the next day.